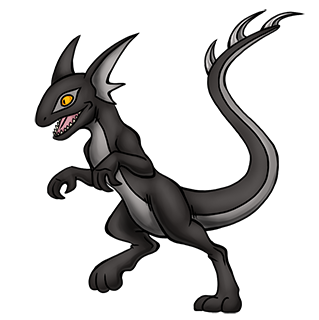 This breed of Foddox was created for reconnaissance and high-speed combat. Its fast-twitch muscle fibres, slender build and large heart and lungs give it high reflexes, acceleration, agility and stamina. It can easily reach a top speed of 200+ kilometres per hour and maintain a steady pace over long distances. It has solid traction on all sorts of terrain thanks to the rough texture of its paws. Its fireballs are relatively weak, but have a high rate of fie. Unlike the standard breed, which only assumes a digitigrade posture while running, the Scout Foddox stands on its toes all the time, giving it a more graceful appearance.